Welcome to IraqFootball.me’s new and exclusive News Round-Up, where we will be recapping news regarding the Iraq national team on a fortnightly basis. Remember to subscribe to our website in order to be the first to read our exclusive interviews, news and features. Fifa have intervened with AFC’s decision to ban Iraq from playing their international football matches in Iran. Throughout the World Cup Qualification so far, Tehran has been host to Iraq’s ‘home’ games, most recently against Thailand and Vietnam, which were held in the Shahid Dastgerdi Stadium, Tehran. However, with Saudi Arabia in Iraq’s final World Cup qualification group, AFC had decided that the Iraq ‘home’ games will be held in other neutral venues, given the sectarian tension between Saudi Arabia and Iran. Initially, Saudi had complained to the AFC with regards to the games being held in Iran due to fear of danger for their fans and team. AFC accepted this complained and filed an investigation into the matter, which later ruled that Iraq will no longer be eligible to play in Tehran. Australia was proposed as an alternative location for the matches to be played in. Taking the news poorly, the Iraqi FA appealed this decision and warned that they would not be prepared to send the Iraq team to Saudi Arabia for away games should the AFC decision regarding Iran stand. It is expected that Iran will continue to be used by Iraq for home games throughout the qualifying stages, however, an alternative location may be used for the home tie against Saudi Arabia. Many fans and journalists have been critical of the condition of pitches Iraq has played in during their WCQ games in Iran. Additionally, the lack of fans present at the stadiums have left many wondering why Iran is actually Iraq’s preferred destination. As of yet however, the outcome of FIFA’s decision is yet to be confirmed. Iraq have confirmed the appointment of a Spanish goalkeeping coach who will join the current staff under Radhi Shenaishil. The manager already has the much adored Spaniard Gonzalo Rodriguez in his setup, who runs the fitness programme for the international squad. Juan Carlos Lopez will be the second Spaniard to join the Iraq background staff after Gonzalo. 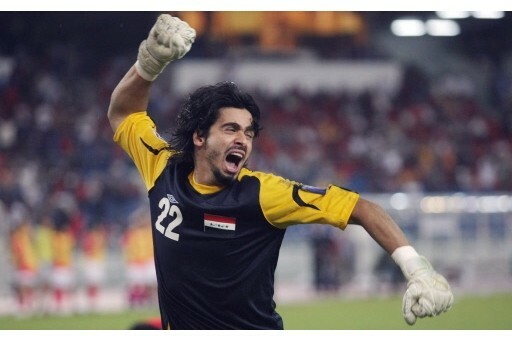 Following Noor Sabri’s retirement, it will be interesting to see who will take the starting goalkeeping position. It is expected that Fahad Talib will give Jalal Hassan a run for his money after a successful Olympics qualification tournament. Emad Mohammed and Younis Mahmoud will be hosting a friendly match in order to raise money for the victims of a recent terrorist attack that targeted a football tournament for children. The name of the fixture will be ‘Your Country Needs You’, where it is expected a whole host of Iraqi legends will feature from previous generations, including Nashat Akram. Brilliant, keep it up guys!